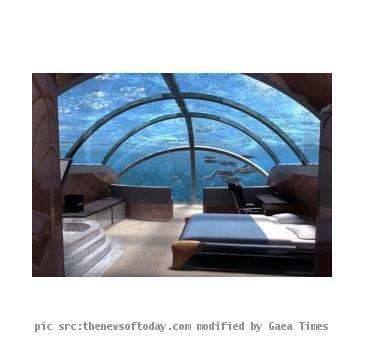 KEY LARGO (Gaea Times.com) - Jules Undersea Lodge is one of the remotest locations in the world for a vacation. Located under the sea in Key Largo, Florida the lodge has been named as one of the most remote hotels in the world. The place is a perfect romantic getaway for people with its undersea view of marine life and the excitement of spending your time living under the sea. Many have been fascinated by the concept of living under the sea as shown in films but this facility which was mostly available to marine researchers has now been made available for the ordinary man as well who seeks a short adventure and perhaps some quite time with himself. Jules Undersea Lodge previously happened to be a marine lab but is now a hotel which can be reached by diving 21 feet through a lagoon that leads to the entrance of the hotel. The lodge takes care of all its guests and completely ensures their safety. A command center locate at the edge of the Emerald lagoon monitors the lodge twenty four hours. The lodge and the command center are connected by an Umbilical cord through which delivers power, fresh air and communication to the lodge. The lodge though is not completely dependent on the command center and has its own backup system. Jules Undersea Lodge offers packages that start from $375 per person per night and goes as high as $1275 a night for a couple. The hotel happens to be an ideal place for romantics to get married as they also handle weddings and provide wedding ceremony/honeymoon package for couples.